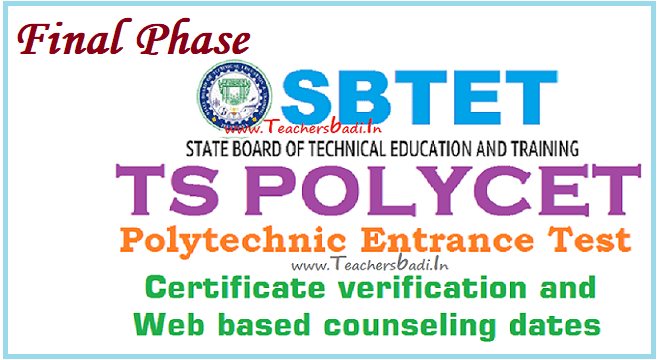 TS POLYCET 2019 FINAL PHASE CERTIFICATE VERIFICATION AND OPTION EXERCISE FOR WEB BASED COUNSELING: Certificates verification dates, Web Option entry dates, Seat allotment results dates are announced for TS POLYCET final phase counselling. Qualified Candidates of TSPOLYCET-2019 who have not attended for Certificate Verification earlier shall get their Certificates verified from designated Help Line Centres mentioned in the Annexure I. The candidates who have participated in Phase-I Counseling can also exercise options using their old password, Login ID, for the leftover seats now available and consequential vacancies that may arise in the process of allotment as per the schedule given below, and it is advised to exercise options for interested Polytechnics assuming that vacancies are available in the course of their choice. 1. Candidates who had passed SSC or its equivalent. 2. Candidates appearing for SSC Advanced Supplementary Examination to be held in June 2019 / NIOS/ TOSS/ APOSS subject to the condition that candidate should have passed SSC Advanced Supplementary Examination on declaration of results. Instructions:1. Options given in the Phase-I will not be considered for allotment and candidates have to exercise option afresh. 4. The special category candidates (NCC/CAP/PH/ Anglo-Indian) who did not get their certificates verified earlier should get their certificates verified now at Sankethika Vidya Bhavan, Masab Tank, Hyderabad only. 5. Candidates residing in Quli-Qutub-Shahi Urban Development Area have toproduce certificate of Residence and Ration Card to take seats available in Q.Q. Government Polytechnic, Hyderabad and they have to attend for Certificate Verification at Q.Q. Government Polytechnic, Chandulal Baradari, opposite to Zoo Park, Old City, Hyderabad. 6. Immediately after Certificate Verification, the Login ID will be sent to the candidates Registered mobile number. All the messages / OTPS / allotment details etc., will be sent to the registered mobile number, hence advised to keep the mobile with you till the end of admission process. Welfare (Edn.) Department shall apply. 8. Caste Certificate issued by competent authority, if applicable. 9. Residence Certificate of candidate for a period of 7 years preceding to qualifying examination in case where the candidate has no institutionalized education. 10. In respect of Non-Local candidates to consider them for allotment under unreserved seats the following certificates needs to be submitted. 11. Residence Certificate: Candidates who has resided in the State for a total period of 10 years excluding periods of study outside the State ; or either of whose parents have resided in the State for a total period of 10 years excluding periods of employment outside the State. above disability are only eligible. permanent address/home town declared by them while joining the service and as recorded in their Service Register are alone eligible to be considered under “CAP” Category. 1. The provisional allotment of seats will be made on 13-06-2019 and will be placed in the website https://tspolycet.nic.in. 5. In candidate’s login, for all candidates after Self Report through online system, the admission number will be generated. Take the printout and report at the allotted college from ..-06-2019 to ..-06-2019 and handover the original certificates.